Deforestation around the Parakanã Indigenous Reserve in the Brazilian State of Para. Their synthesis of current studies on species extinction, distribution, and protection also shows that emerging technologies could give scientists and policymakers more efficient means to identify the species at greatest risk and to take protective measures to preserve biodiversity. These technologies include satellite imaging, online databases and super-computers, and crowd-sourced "citizen science" through smart phone apps, which are making it easier for both scientists and laypeople to collect data on species and track human activities such as deforestation. "On par with climate change, intensifying land use has been identified as one of the grand challenges of environmental science. Land use and land cover affect local, regional and global climate; biodiversity; hydrologic cycles; and soil productivity," said team member Joseph Sexton, a research associate professor in the University of Maryland's Department of Geographical Sciences. "Many of these impacts are long-term legacies, from centuries to millennia. Land cover changes also feedback to economies, altering, for example, the value of agricultural land and residential property." "The biodiversity of species and their rates of extinction, distribution, and protection" by Stuart L. Pimm, Clinton N. Jenkins, Robin Abell, Tom M. Brooks, John L. Gittleman, Lucas N. Joppa, Peter. H. Raven, Callum. M. Roberts, and Joseph O. Sexton, appears in the latest issue of Science. The paper includes an overview of current advances in conservation facilitated by new technologies, and also identifies areas where more information is needed. One major area of concern is that most species remain unknown to science, and therefore likely face greater threats than known species. New and developing technologies can help close that knowledge gap—and therefore related action gaps—the authors say. 3. New technologies—including remote sensing efforts conducted at UMD's Global Land Cover Facility (GLCF)—make it easier to find and monitor species and focus conservation actions more efficiently; and 4.Supporting and expanding international databases and tools that help identify and track new species is critical to helping scientists zero in on environmental trends and patterns that might otherwise be missed. Technologies are also enabling scientists to identify critical patterns and trends among aquatic and marine species, in addition to terrestrial ones. The study confirms that freshwater species are likely more threatened than species on land, and also finds that the potential for species' extinctions in the oceans has been severely underestimated and their protection neglected. "Natural ecosystems are complex and potentially chaotic systems even in the absence of human activity; and with escalating human impacts, understanding the interactions between physical, biological, and social systems is increasingly crucial—not only for conserving ecosystem function, but also for adapting socio-economic systems to their changing biophysical environment," Sexton said. "Geographic Information Systems enable interdisciplinary study of the Earth system by coordinating data from disparate sources in a common system. However, studying the dynamics of human and natural systems requires observations that are not just spatially coincident, but extensive in time as well. Ecology—as well as other sciences adopting the geographic perspective—needs consistent, long-term, data records to study the complexities of the changing Earth system." Professor Sexton's involvement with this research has been through the Global Forest Cover Change project, a NASA-funded initiative to retrieve the long-term global history of forest cover and change at high resolution from the archival satellite record. This research, carried out at UMD's Global Land Cover Facility, produced the first global, high- (30-meter) resolution map of tree cover and is now producing the first global, high-resolution maps of forest cover and change prior to 2000.The data are being provided through an open-access policy through the GLCF website. They are already being used at a rate of several terabytes per month by ecologists, climatologists, economists, and other scientists and policy makers to understand and manage economic and ecosystem changes at scales from local to global. The University of Maryland's role in this analysis is the latest example of the impact of UMD leadership in remote sensing and its use in understanding interlinked environmental trends and phenomena, including changes in land cover, land use and vegetation states, species loss, and climate change. 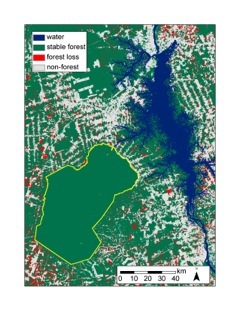 Last year UMD – ranked fourth among research institutes worldwide in remote sensing research according to the journal Scientometrics – led a multi-organizational team that created the first high-resolution global map of forest extent, loss and gain, and made it available as a regularly-updated, free resource.